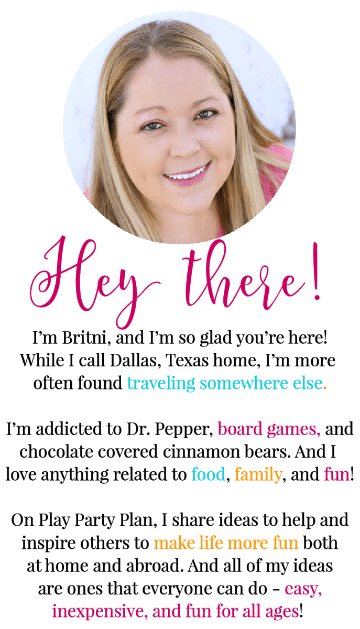 This is a sponsored conversation written by me on behalf of Barilla® . The opinions and text are all mine. 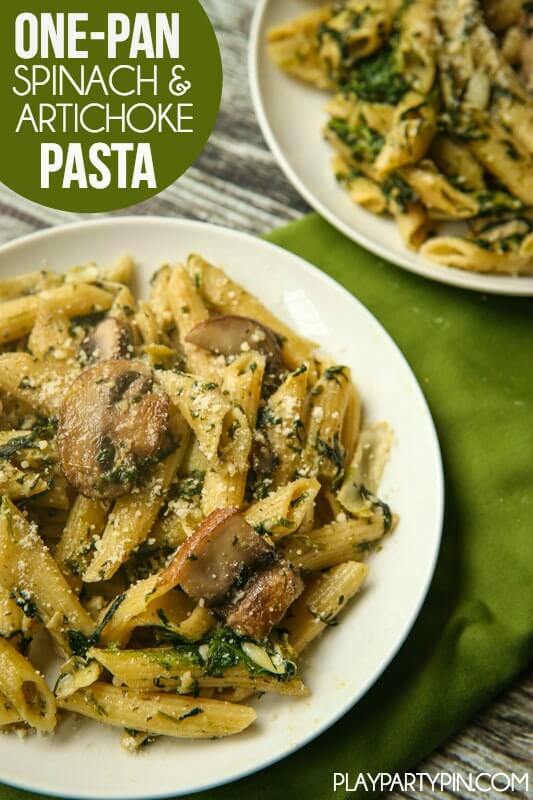 This one-pan spinach and artichoke pasta recipe is perfect for a quick weeknight meal! There are very few things I hate more than doing dishes. When I was growing up, I was actually allergic to dish soap, which probably added to my hate of dishes. Dish soap would literally make my arms break out in red itchy bumps, so I’d either wear gloves to pass off the dreaded chore to another sibling. Those were the days. These days I’m not so lucky. My dish soap allergy seems to have gone away (replaced by a cat allergy that came from who knows where) but the dishes haven’t. I swear I would eat on all paper goods if I didn’t feel so bad about throwing away so much trash every day. So unfortunately with a two-year-old, not doing dishes isn’t really an option. But having less dishes is. 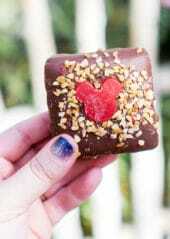 My husband’s a gourmet cook. Like if he wanted to go to cooking school and become a professional chef someday, I really think he could. His meals consist of things like almond chicken with a creamy cauliflower puree and deconstructed chicken noodle soup. 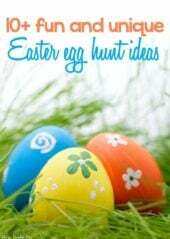 My meals consist of the easiest possible recipes I can get my hands on. 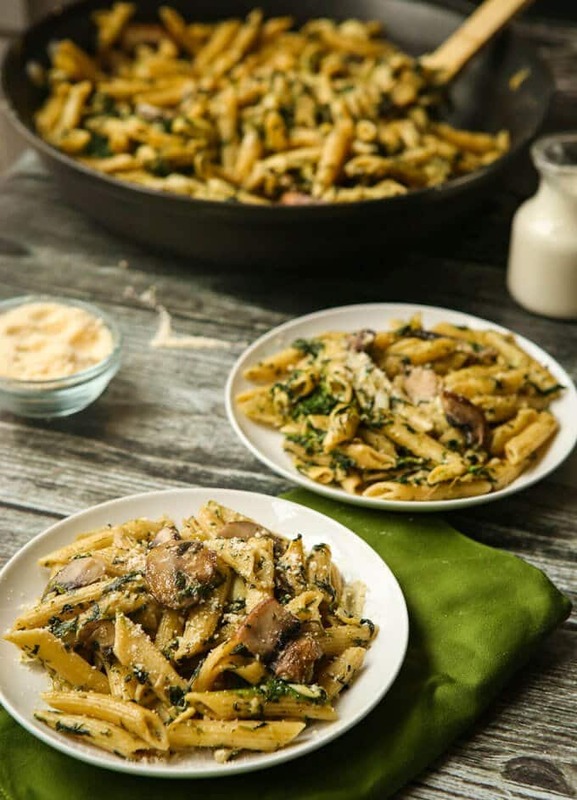 This one-pan spinach and artichoke pasta is one of those easy, yet still delicious, meals. And best of all, one-pan means that there is only one pan to wash. I told you I’m good at coming up with ways to avoid dishes. 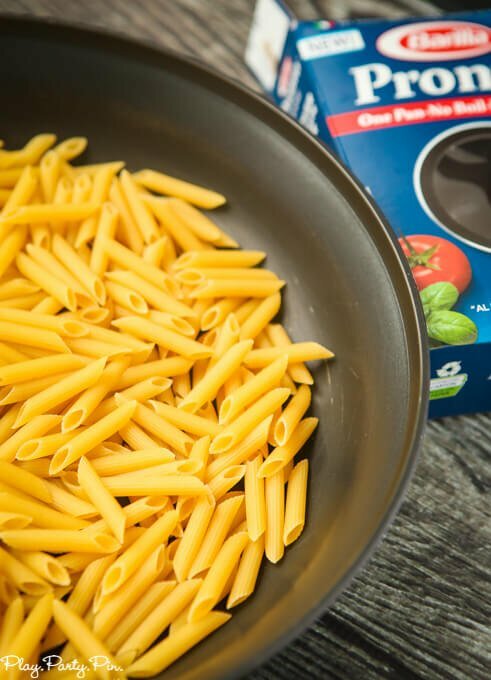 The recipe starts by cooking one box of the new Barilla® Pronto™ Penne pasta directly in the pan that you’re going to use for the rest of the meal. 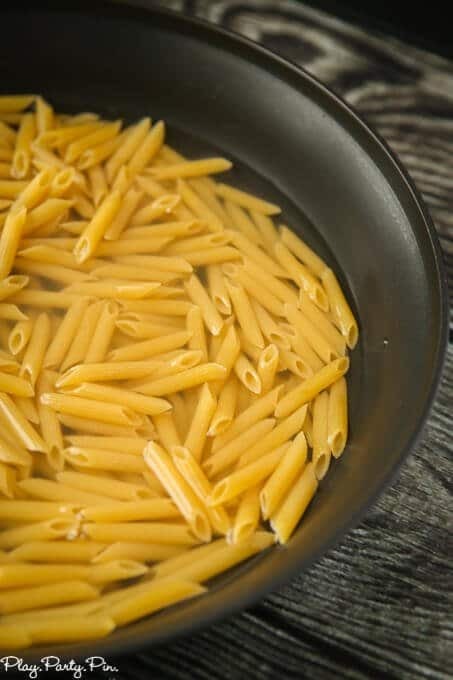 Put the pasta and liquid in the pan and let it do its thing for 10 minutes or until the liquid has been soaked up and the pasta is cooked right in the pan. Yes, you read that correctly. You do not have to wait for the water to boil, you don’t have to strain the pasta, you don’t do anything but let it cook. If you haven’t tried the new Pronto™ pasta yet, run to your grocery store now to buy a box, or five. It’s seriously a game-changer for both time spent washing dishes and time spent actually cooking dinner. It definitely makes it easier for busy people like me to get cooking. Anyway, back to the actual recipe. 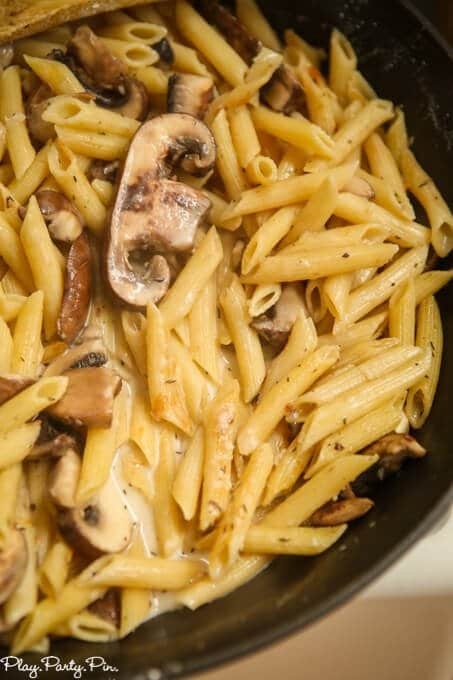 Once the pasta is cooked, make a little hole in the middle of the pasta and add the butter, garlic, and mushrooms to let them get all juicy and delicious. Then you add in a little chicken broth and cream to deglaze the pan and let it simmer until the additional liquid is all soaked up. Last step is adding in your spinach, artichokes, a little nutmeg and of course, parmesan cheese. Mix it all together right in the same pan! It sounds easy because it is. I made this for lunch today while my son watched one 25 minute episode of Dino Dan; it’s really that quick. 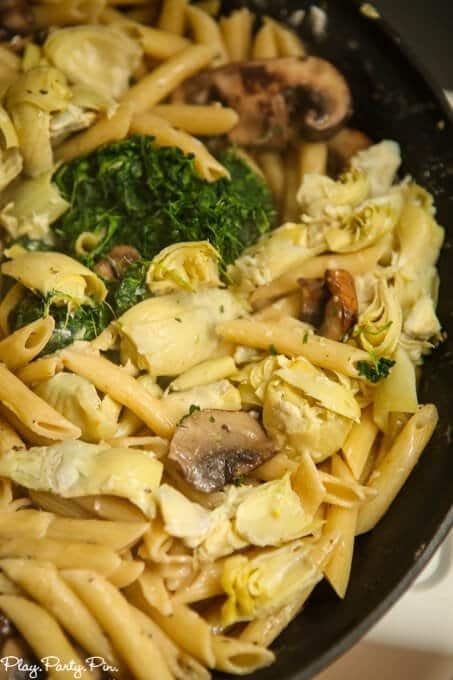 The best thing (other than only having one pan to wash) about this recipe is that it’s also a great meatless Monday dinner recipe and perfect for vegetarians if you just substitute the chicken broth for vegetable broth. And with all of those mushrooms, you really don’t even miss the meat. 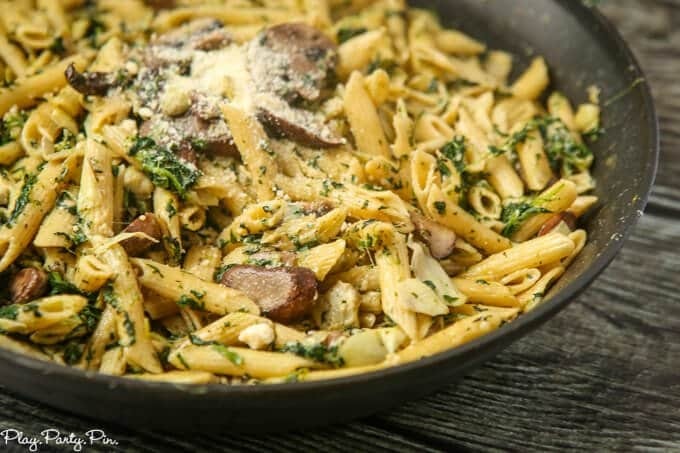 Find more great one-pan recipes on the Barilla® Pronto™ website. 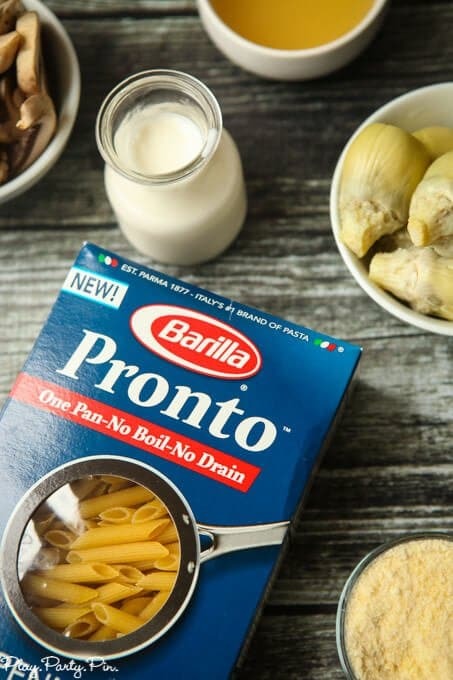 Pour box of Barilla® Pronto™ Penne into either stainless or non-stick skillet then pour 1 cups water and 1 cup chicken broth into pan, making sure liquid covers pasta. Cook for 10 minutes on high or until most of liquid has evaporated. 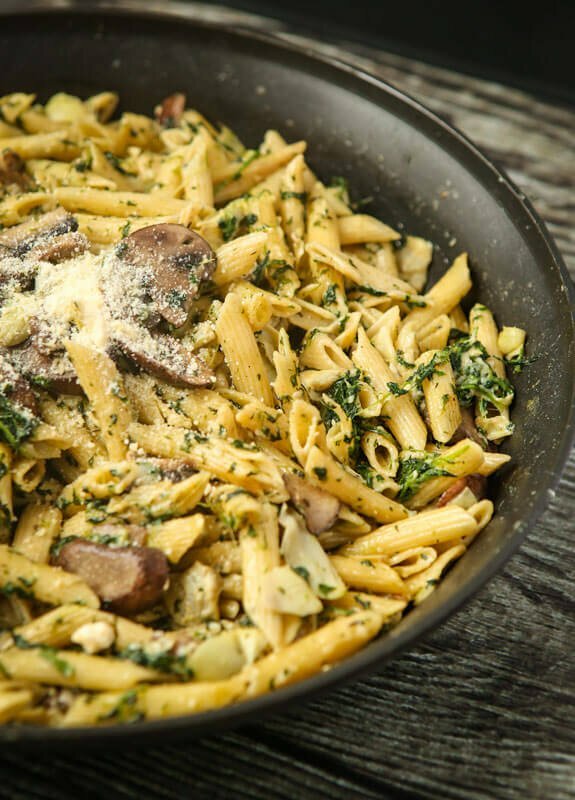 Make space in center of pasta (leaving pasta in the pan) and add butter and garlic and swish around for 30 seconds then add mushrooms. 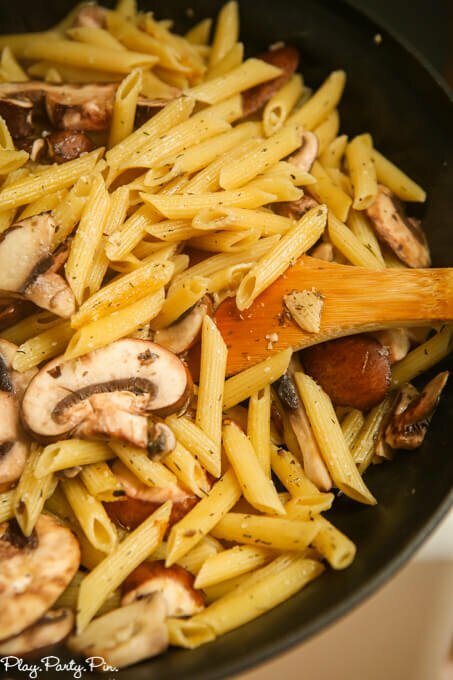 Sprinkle thyme over mushrooms and stir until they lightly brown. Add salt and pepper to taste. 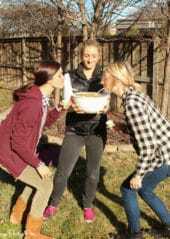 Sprinkle flour over mushroom/garlic mixture then whisk in 1 cup chicken broth, add cream, and simmer over low heat for 5 minutes. Stir in the artichoke hearts and spinach and stir to combine. Add nutmeg and more salt/pepper to taste. 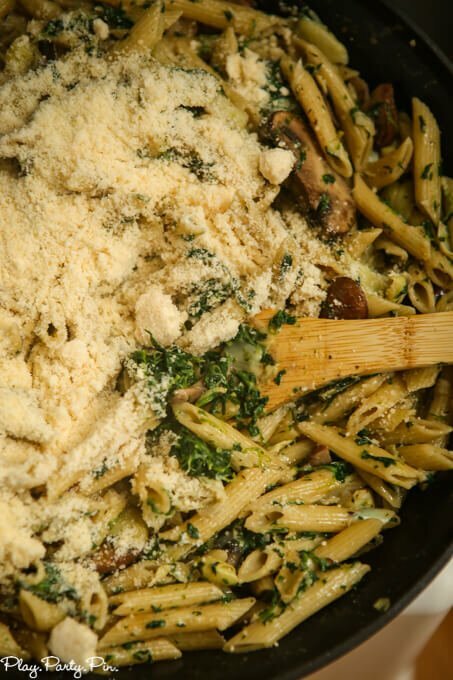 Add parmesan cheese to pasta and toss to combine. Make this a vegetarian dish by substituting the chicken broth with vegetable broth. 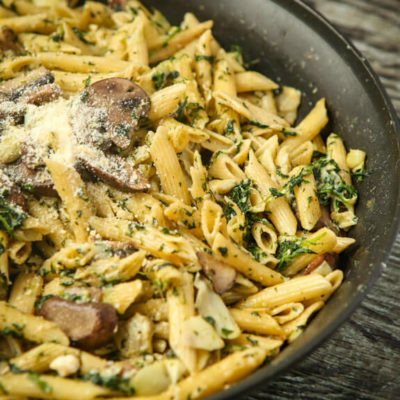 How would you use Barilla® Pronto Pasta?